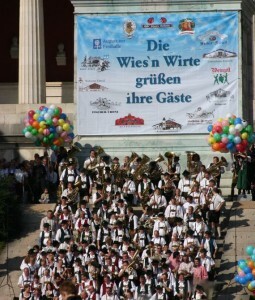 At the foot of the statue of Bavaria, the choirs of the Oktoberfest halls come together for a concert. During this event around 300 musicians, conducted by “guests” of the organisers, play popular Marches and Melodies together. Before the end, thousands of coloured balloons are released, which adorn the sky above the Theresienwiese. For all those who have the opportunity to conduct here each year, it is an immense honour and a special tribute. The Mayor of Munich is the only organiser who is certain to participate; he has only been absent once due to illness. Usually anybody who works for the Wiesn city council (Wiesnstadtrat) can also conduct, otherwise this honourable task is divided among the breweries, the hosts of the Oktoberfest halls and also among the city’s leaders, who also have an excellent chance of climbing up onto the stage at least once. 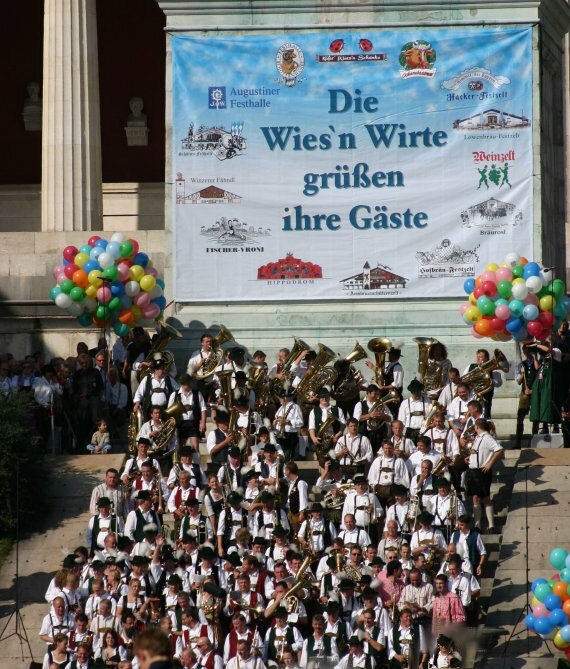 In 2012 among others who participated as conductors were: Dieter Reiter, festival director, Maria Schottenhamel, festival host, Fred Geißler, leader of the Bräurosl Ludwig Thoma Musikanten Choir, the head of Spaten, Günter Kador, member of the Wiesn city council, Helmut Schmid, Graslhof Winklhofer, host of the ZLF festival, KVR representative, Dr. Wilfried Blume-Beyerle and Peter Harwich, chief of police and head of the Wiesn guard. Upon its conclusion, the mayor conducts the choir in the Bavarian Defiliermarsch. With the finale, all participants must certainly feel a shiver when the countless coloured balloons float through the air while the Bavarian anthem is sung in unison by the bands on stage together with the public. All this at the foot of the statue of Bavaria under a brilliant sky.